With multiple locations on the island of Aruba, Advantage is positioned to be one of the best rental car companies that you could deal with. Be sure to rent with Advantage and save on your next minivan, luxury car or midsize. If you are an enthusiastic diver, then you are probably visiting the beautiful island of Aruba to get in some diving action. Well finding a good place to dive can be hard, and finding a good charter to do it can be even harder. Lucky for you it can be as easy as contacting the JADS Dive Center! This great group lets you dive in some of the most popular spots with the most scenic dives! This great company treats you like family, letting you aboard their awesome 26’ vessel and taking you out to sea. With a convenient location the JADS Diver Center can make your diving experience a memorable experience! On property you can find a bar and grill, a rinse area and washrooms, all for your convenience while you dive! The best part about this dive center is that they welcome all divers from all experience levels! So, while you are in the Aruba area be sure to head on over to JADS Dive Center and enjoy all the fun and entertainment of the beautiful ocean life in the area! Avis Rental Cars operates the world's second largest general-use car rental business, providing business and leisure customers with a wide range of services at more than 1,700 locations worldwide. Choose Avis Car Rental for your next Aruba Rental Car, and enjoy our discounted rental car rates. If you’re visiting the beautiful island of Aruba then you are probably on vacation! This tropical paradise is the perfect getaway adventure! So while you are on the island you will probably be looking for a place to kick back and relax. 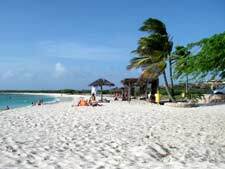 Well Aruba has a bunch of places that can offer you a relaxing experience, but one of these stands out above the rest, and that would be Arashi Beach. Some beaches are too crowded with tourists, others are too rural and you feel alone, but with Arashi beach the ratio of people is just perfect. With plenty of room for you and your family to relax under the sun and enough people that you feel safe this beach offers everything from food to fun to entertainment! The crystal clear waters make a perfect contrast against the snow white sand, and the further off shore you go the more snorkeling opportunities you will find! With tiki huts for shade you can enjoy your lunch out of the sun! Arashi is the perfect choice for your beach excursion; you can even see the lighthouse from here! These internet rates for an Alamo Aruba Rental Car are unbelievable! No credit card needed to make the reservation! We have negotiated the lowest online rates for vehicles in Aruba with some of the largest Rental Car companies in the world. Some of our contracted partners for Aruba Rental Cars include Thrifty, Alamo, Dollar, Budget, Avis, Hertz, and Enterprise. Check our latest specials if you plan on hiring a car for your next trip to Aruba. A trip to Aruba would be incomplete without visiting some of the top attractions in the area including: ABC Jeep Tour, Seaport Village, Kukoo Kunuku, Let's Go Latin!, Arashi Beach, Malmok Beach, Druif Beach, Bonbini Festival, Pedernales, Bachelor's Beach, Malmok Reef, Seaport Casino, De Palm Tours, Tessa The Tiger, Arikok National Park, Seroe Colorado, and the Grapefield Climbing Area. The most convenient way to get around would be with an Aruba Rental Car or Aruba Minivan Rental. We have partnered with Budget Car Rentals to offer you 10% to 25% savings on your car rentals. Budget Rent-A-Car is a fantastic car rental company with the largest selection of Aruba Rental Car in the industry. With over 3000 worldwide locations, Discounts coupons for Budget Rental Car have never been easier to find. If you plan on dining at any eatery or restaurant during your visit to Aruba, Rentalcarmomma has some top restaurant recommendations for you! Azull, Blossoms, CafÃ© Baci, Captains Table, Chalet Suisse, E Piscado, EetcafÃ© The Paddock, French Steakhouse, The Hang Out, and The Islander Grill showcase the best taste bud teasers in Aruba. Other recommended restaurants in Aruba include Las Ramblas, Madame Janette, Mangos Restaurant & Cocktail Bar, Marandi, O-Sushi-Mi Bar, The Old Cunucu House, Pago Pago, Pizza & Pastabilities, Que Pasa?, Red Sail Sports, Tabasko, Alfredos Ristorante, Astoria Bar & Restaurant, and Avallones. Aruba attractions that an Aruba Rental Car would make more accessible are: Boca Ketu, Fisherman's Hut, Conchi di Tortuga, Stonehenge of Aruba, Atlantis Submarines, Jane Sea, Blue Reef, Lago Reef, California Wreck, California Dunes, Roger's Beach, Aruba Archaeology Museum, Numismatic Museum, De Man Shell Collection, Aruba Sail Cart, Wilhelmina Park, Museo Arubano, and the Martin Booster Tracking. Check our discount rates for vehicle rentals in Aruba! Of course...Thrifty Rental car has great cars at great rates. But did you know we also have great deals on an Aruba Rental Car? Check out the many car rental discounts and promotions being offered by Thrifty Car Rental - now a RentalCarMomma partner. It's the easiest and fastest way to get a car rental quote or reservation online from Dollar Rent A Car! Dollar Rental Car offers unbelievable rates for Aruba Rental Car. No Credit Card Needed for Reservation!